Reality, Self, Knowledge, Self Knowledge. Empiricism may seem contradictory to many spiritual practices, but some of them manage to fit more comfortably alongside empirical approaches to knowledge. An empirical approach is one that says that all knowledge ultimately comes to us in experiences through one of our five senses. This is opposed to the claim that knowledge of things can come to us through revelation, intuition, or other means beyond our physical senses. Even mere reasoning, without some basis in experience in physical evidence is not enough to generate true knowledge on its own. Knowledge, then, is when we hold concepts about the world which are both true (they match reality), and justified (they are based on some physical evidence verifiable by the senses, and not merely true by chance or coincidence). How can such an approach to knowledge be compatible with a spiritual practice? As a Humanist, the above describes my own position on knowledge. I look at it as a matter of humility. When asked what I think about invisible or unproved things, or the possibility of life after death, or the ultimate secrets of the universe, I am content to say "I don't know". Many of these things certainly aren't impossible. In fact, it's actually likely their are many things that are true about reality that we have not yet experienced, and may not even be capable of experiencing. But we must be humble in accepting that as limited human beings, we are imperfect in our ability to know all things. This practice of humility when it comes to 'what we say is true' not only applies to the supernatural, but to all things. It is a spiritual practice important to good character. Let's look at another philosophy: Buddhism. One can certainly find Buddhists who believe in all manner of unproved things. The various branches and ways of practicing Buddhism are many, and infused with the cultural heritage of their geographically related manifestations. But the Buddha (Siddhartha Gautama), when asked about whether the world is eternal or finite, whether the soul and body are identical, whether we exist after death said that those kinds of things were not beneficial and did not lead to wisdom. He said that no matter how long you live you won't be able to answer all of the metaphysical questions, and that these had nothing to do with the fundamentals of religion anyway. Instead, what he offered was a way to address suffering in the here and now. What is perhaps even more central to this issue in Buddhism is the Kalama Sutra. This teaching says that one should not trust reports, tradition, or hearsay. One should not be lead by the authority of religious texts, by mere logic or inference, by mere appearances, by seeming possibilities, by delight in speculative opinions, or merely on the authority of a teacher - including even the Buddha himself. Rather, one should find out for oneself, through experience, whether something is true or effective, or if it is not. In the West, several ancient Greek philosophies also valued reason and observation in seeking knowledge and understanding - as such, they were rationalists. The Stoics and the Epicureans believed that a person was born a blank slate, and that knowledge came to him through the senses. However, the Stoics believed there were some "common notions" or innate ideas in all people's minds that did not come through the senses. These were very rudimentary things like, how we know to categorize and question things, a basic sense of longing for fairness or the good, and so on. These were likely struggles to understand the underlying responses shared by all newborn human beings due to the makeup and natural behavior of the human brain and our evolved instincts. Nevertheless, when looked at on the overall spectrum regarding knowledge, the Stoic model more closely aligns with empiricism rather than mysticism or other means. So both of these Eastern and Western branches of what we today would call 'spiritual' or contemplative paths have some kinship to empiricism. The reason it seems so contrary today is because, often in contemplative practice, the goal is to delve into the subjective, and empiricism is thought to deal with the objective. Generally, we conceive of the scientific approach as one where we examine some external phenomenon from the third-person perspective. But what if the thing being studied is, by nature, a first-person phenomenon? In contemplative practice, we are attempting to uncover practices that result in the experience of happiness in life. In building and propagating these contemplative lessons we are trying, not to understand the function of the brain as an organ from the objective point of view, but rather to understand the nature of the experiential mind from within. The essence of empiricism is that we do not rely on authority, revelation, or other unproved means of gathering information, but instead rely on our direct observation and experience. Certainly, this includes various means to extend our senses, as well as cross-correlation with the experiences of others. In all cases of empirical observation, even on the study of external things such as planets and stars, and no matter how objective we try to be in our methods, the matter will ultimately boil down to a subjective, first-person experience. The most tested instrument will, in the end, show a reading that will enter my eyes and become my own personal experience. In contemplative practices where we try to learn about practices that effect our own minds from the experiential perspective, the only way to test those practices is to perform them and experience the results directly. Because all third-person empirical observation ultimately ends in a subjective first-person experience, the only difference between these cases, and cases of the first-person empirical approach is in the number of steps removed the observer is from the observed. In traditional empiricism, there may be dozens of steps between the outer reality, and the final subjective experience of the data. In first-person empirical study of the mind, there is only one step. Therefore, not only is a first-person empirical experience the only possible way to measure the efficacy of contemplative practices on the mind, but it is actually far less prone to error than traditional empirical methods. However, I would be remiss not to point out an important distinction. The reason first-person direct experience is the valid way to study contemplative practices, is because the alleged phenomenon being studied is a first-person phenomenon (that being, the experience of a contented life, greater long-term peace, greater concentration/focus, better handling of emotional responses, more compassion, etc resulting from said practices). Where we are prone to disaster is if we take a first-person approach to third-person phenomena. For example, were we to think that we can 'directly and internally experience' the nature of the surface of Mars or the cause of a disease by meditating on it, there would be a disconnect between the reality and our final stage of data. There would be no confirmed and reliably proved method by which the external facts made their way into our heads. Indeed, some people claim these sorts of perceptions, but alas no one has ever been able to reliably and repeatedly confirm them under controlled testable conditions. Again, that doesn't mean the truth of such claims isn't possible, it just means that the humble person will acknowledge them as yet unverified and unknown, allowing for the possibility - even likelihood - of mistaken perception, self delusion, or fraud. 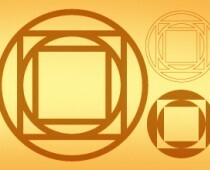 By the way, the symbol presented above is one I thought of today - a stylized venn diagram of sorts. It represents knowledge and self knowledge. The large one is the main symbol, but I've shown two other styles it could be presented as to the right. With such a simple form, I was surprised not to see it listed at symbols.com, perhaps meaning something else. The outer circle represents reality. The square inside that represents us (or more specifically our minds). The circle inside that square represents our internal model of reality - a reflection, we hope, of the true external reality, or knowledge. Of course, our minds are a part of reality as a whole, which is why the square is inside the circle. Therefore another smaller square is inside the smaller circle as well. This smallest square represents self knowledge. It is our internal model of ourselves - a subset of our internal model of reality as a whole. Thus, we cannot have true understanding without also having understanding of ourselves. This touches on the possible pitfalls we face in our efforts to learn, if we are not cognizant of our own limitations on knowing and humble in our assumptions. See Majjhima Nikaya 63, and the Parable of the Broken Arrow.